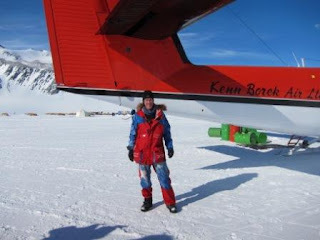 The South Pole: Solo but not Alone: Photos from Before and up to the the Start of my Solo Expedition. 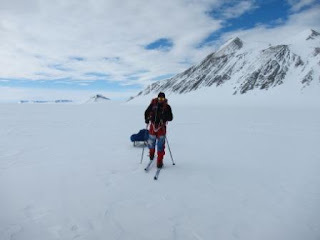 Photos from Before and up to the the Start of my Solo Expedition. 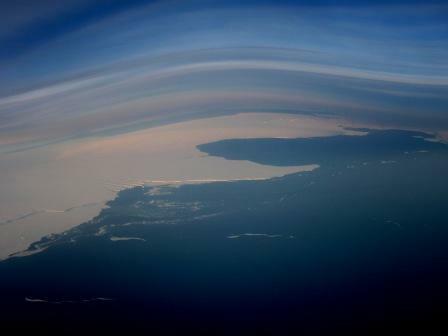 Pic 1: Flying from Punta Arenas to Antarctica: The first views of the Sea ice of the Antarctic Peninsular, from the porthole of the Ilyushin. I can remember the excitement I felt as I looked down at the continent I was going to spend the next 6 weeks and more, most of it on my OWN! Most people slept on the flight, but I moved excitedly between the left and right portholes filming what I found truly awe inspiring scenery. 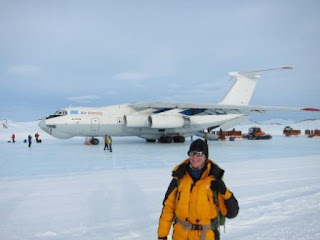 Pic 2: Ruth walking off the blue ice runway at Union Glacier, soon after our arrival in Antarctic with the Ilyushin Il-76 we flew in on in the background. 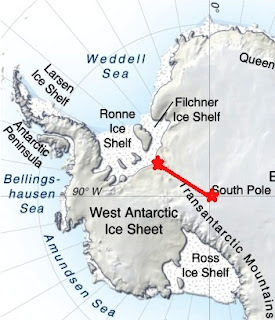 Unlike the plane I flew back from the Pole on, which has ski's, the Ilyusion lands with wheels on the ice, like a normal aircraft on a asphalt runway. You can see the blue ice of the runway where the plan is parked. 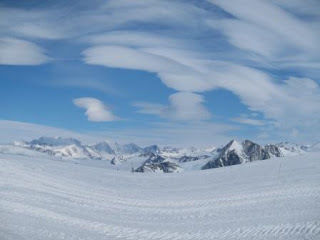 Pic 3: The surrounding nuataks at Union Glacier, and an example of the great cloud formations around the mountains, most days. The weather there was just fantastic, sometimes felt like one needed a beach umbrella! 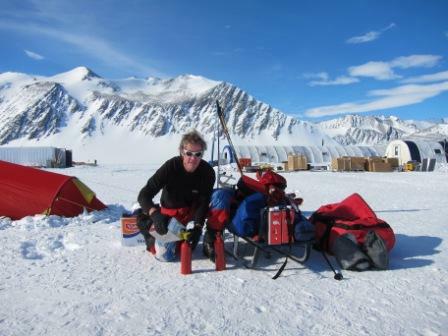 Pic 4: Almost the last, and critical job before heading off from Union Glacier: Filling my two stove fuel bottles with fuel. You can see the two red cans carry my other fuel stocks. All in all I took 10 liters, which proved to be too much. Better safe than sorry though! Pic 5: Sled fully packed and ready to go! 88 kg of sled! Most of the sled bag was food, so by the time I reached the pole the bag was almost empty, and the sled weighed a lot less! That's my full wind suit gear, the same that I used fro the North Pole, and it worked well, but the pants definitely had their last expedition! The blue tent in the background is the main tent we we ate everyday....nice and warm, and sociable. 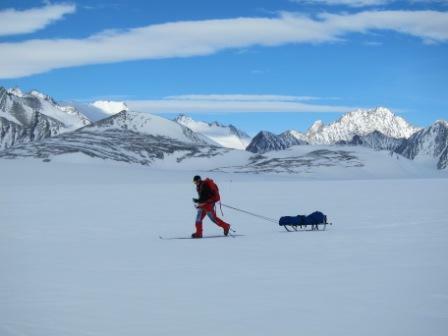 Pic 6: Final checks and training ski-ing with the fully loaded sled and backpack at Union Glacier. It's a beautiful place! A funny feeling within at this point: Huge excitement, but also huge apprehension! I can feel it in me now as I type this! 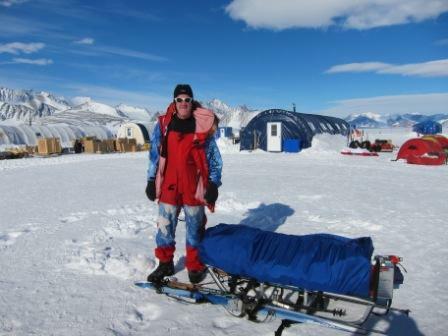 Pic 7: Another shot of me doing final ski / sled / backpack checks at Union Glacier I had a larger backpack than most others would have used on their expeditions. Relying on fish scales for traction (rather than skins), I was was trying to have a lighter sled, and heavier me for a good traction to pull formula.... It worked well until I had to walk those few days around 86 degrees South. 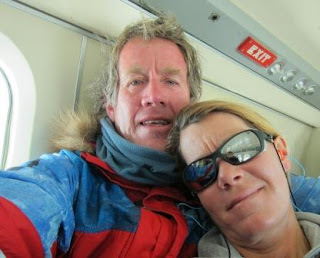 Pic 8: 21 November 2011: Minutes before take off to the Messner start. That's the tail of the Twin Otter that took me too the start. 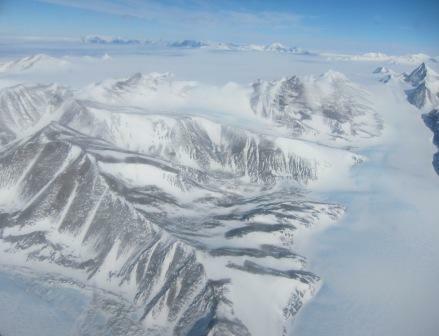 Pic 9: What an amazing flight from Union Glacier to Messner Start: We flew over this mountain range, and the true beauty of Antarctica was immediately apparent. Untouched and timeless beauty. These are wonderful examples of hug nunataks. 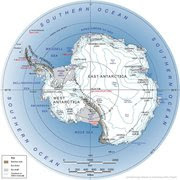 The base of these mountains lies way, covered by the larges ice cap in the world. This is just what one needs to fuel the adrenalin for what lay ahead....! Pic 10: I'm surprised how relaxed I look!! This is Ruth and I in the cramped cabin of the Twin Otter, minutes before me landed at the start in the middle of 'nowhere', but supposedly at the very edge of the Antarctic continent, 88 degrees 20' South! Within 30 minutes of this photo, we had said our goodbyes and I was ski-ing off alone into the nothingness, only to see her again some 38 days later...I did have a quick thought flash through me: "Will I ever see her again?" Hmmm, emotional stuff! Check out the Photos Actually from The Expedition in the Earlier Post...! CONGRATULATIONS Howard. A fabulous picture story of your very own incredible journey. It's still hard to believe how you could do that whole trip entirely alone. Awesmome! Really awesome post its all information is really helpful for me and other users. The finale: Ruth and I together again!